Jay Z’s new 40/40 club opening has been less than smooth. The reports from the employees are that the owner is less than professional and wasn’t prepared for the December 30th opening. From what we have read, over 100 or staff members have been either fired or have walked off the job and out of the 10 original managers only 2 remain. The managers were let go for questioning operational procedures. It was also reported that 55 of the 90 security staff were also let go. From our understanding the staffers that were fired were done so without valid reason or over petty issues. One report covered areas that the staff was never trained on the new cash register system and any breakages or spills had to be paid for out of their employees pocket. I do not know what this says about the owner or operating partner Desiree Perez. I don’t know if it was a scare tactic to get the other employees to understand who is boss or the fact that they ramped up the staff for the big New Years bash. Only time will tell the true story, since everyone has their own version. I have read many posts on Forums, Blogs and other websites, for and against the Jay Z 40/40 club, but there is an overwhelming posts bashing the club. If I were the club owner, I would keep quit, fix the employee issues and let this pass. 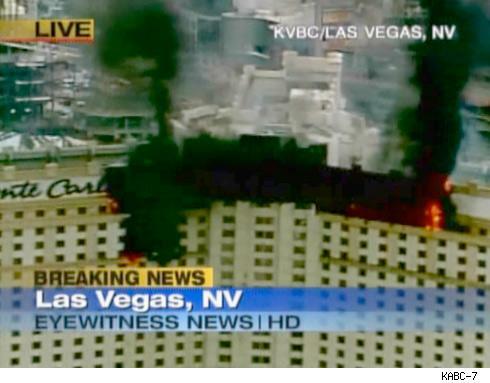 There is a three alarm fire at the Monte Carlo hotel in Las Vegas, that is spreading black smoke throughout the Las Vegas Strip. 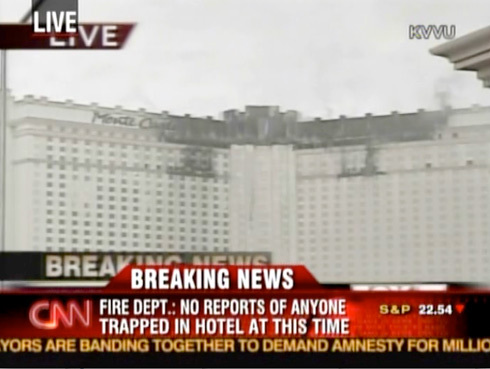 The Las Vegas Fire Department said the Fire was reported around 11am Vegas Time and burning through the south tower. Clark County Fire Chief Steve Smith said 13 people suffered from smoke inhalation and all 1,000 Monte Carlo employees were accounted for. He also said that 120 firefighters and 35 fire trucks and other equipment from Clark County, Henderson and Las Vegas Fire Departments were at the blaze, which he called an exterior fire. 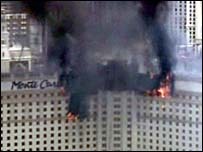 He said the exterior of the building was made of a very flammable foam facade. The hotels around the Monte Carlo have been evacuated. The Monte Carlo Guests are staying at nearby MGM/Mirage Properties. From the news reports and pictures, things don’t look good. 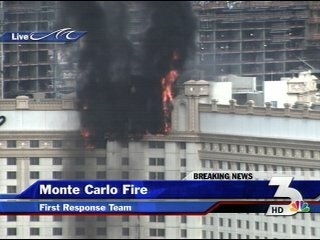 From the news feeds it looks like the outer skin of the Monte Carlo was on fire. Even Chief Steve Smith said, the inner parts of the building were hardly touched or torched (however you want to look at it). There was also a report of Welders on the roof… which only raises questions. I recorded the first of many Vegas Podcasts with The Vegas Tourist crew last night. Sazzy, the better half of the Podcast will be on Vacation either sailing the high seas or causing mayhem in you area so I will be taking over while she is away. I will do my best at being “Sazzy-esq” and not mucking up the works too much, they do a great Podcast and I know I can add to the dynamics. This upcoming Vegas Podcast all three of us, Sazzy, Mark and myself tear up the “airwaves” with news, information and jokes. The $1.9billion Palazzo Casino-Resort will celebrate its grand opening from Thursday to Saturday with a concert featuring Diana Ross. It is the first new property on the Vegas Strip since April 2005, which is the Wynn Las Vegas. The Palazzo is not fully functional yet. 50% of the shipping mall is open and 2,300 of the 3,068 rooms are expected to be available. The Palazo Features Jay Z’s 40/40 sports bar and lounge and the world’s largest Canyon Ranch SpaClub. This opening is not without controversy, Jay Z’s permit was written over a weekend. So what you say, well this is unheard of since the permit office is closed on weekends. There are accusations of preferential treatment and it has some up in arms. We will have to see how this plays out. Thank you for your comments on the Vertical Farm and makes perfect sense. Read the article and thought it was very good. The thing that struck me was the local angle of what this type of farm could mean to the quality of food here in Las Vegas. Typically in the last 10 years the quality of food in Las Vegas has been outstanding in the casino’s and the restaurants. For locals this isn’t the case. Local groceries get the majority of their produce from California. Having grown up in the mid-west it becomes clear very quickly that produce grown in California is substandard. One of our biggest complaints in living here is the size, availability, and quality of the produce. I actually look forward to going home to get something to eat! When ever a new project is projected for this city you have to take it with a grain of salt. You just never really know if it will happen or not. With this project it would be nice to see some of this wonderful produce hit the local shelves, and not just the casinos. And of course, its new and different and Las Vegas will embrace it and make a profit, its what Las Vegas does best! 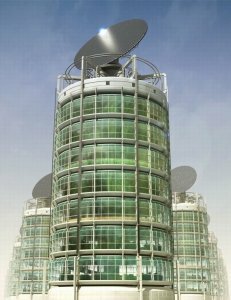 According to reports at Next Energy News, Las Vegas will again lead the nation on the technology front by building a 30-story farm. The Vertical Farm will supply enough food to feed 72,000 people. From what we found out the food will mainly be used for the casino hotels. 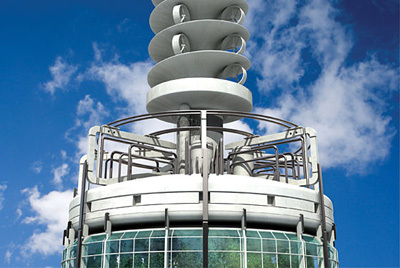 The concept/design work should be finished in the middle of 2008 and then the ground breaking will start. The project should be finished by 2010 and cost $200 Million. The location and exact dates are not yet available but I am sure the world will be watching this advancement closely. With an annual revenue of $25 Million and $6 Million in operating expenses per year this Vertical Farm will net a $19 Million dollar profit per year in just produce and possibly another $15 Million in tourism. Sounds like a great business deal, but does it? I am sure there will be some backlash from the traditional farmers from the Midwest, Prairie States and California. These states provide most of the Las Vegas produce currently. I am not sure about the technical specs but I hope the tomatoes don’t taste like hot-house. Does Vegas or the state of Nevada have a conscience or do they need one? I am sure some farmers will be hurt by this latest advancement, but Vegas is into reinventing itself and I guess it expects the farmers to do the same. I do not understand some of the selling tactics for this project. Why do Nevada officials need to demonstrate their environmental awareness on waste and excess. The process currently goes like this: Produce is bought from farms, delivered to Vegas and then disposed of by throwing it away, composting or giving to the older gentleman who feeds it to his pigs, (thanks “Dirty Jobs” Discovery Channel). The only excess is when the Las Vegas Resorts order the wrong quantity. The only thing the process changes is the origin of the produce and not where it comes out in the end (pardon the pun). If anyone has an answer on how rotting produce harms the environment let me know and I will stop composting. I understand the future is coming but at what expense. Will the US Government have to subsidize the farming industry again? I hope the people in charge are a lot smarter than me and really thought this out to the last possible solution. Don’t get me wrong, I love new tech and think the Las Vegas Vertical Farm is a cool idea. I wish I came up with the funding and sold it to Nevada. LDCs. If this should prove to be the case, then VF may be a catalyst in helping to reduce or even reverse the population growth of LDCs as they adopt urban agriculture as a strategy for sustainable food production.